The same mountainman style only with large flaps & ties that close well under your chin offering the most in cold and wind protection. 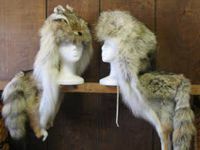 Mountain Man hat with caped back, coyote fur - and available with or without face (as shown). How to measure hat size.